This is the terrifying history of how Dr. François “Papa Doc” Duvalier used terrorism to reach power, and how he institutionalized terrorism as a weapon of the State. The book reports in detail the stories of the many unsuccessful attempts to end Papa Doc’s inhuman tyranny and why they failed. The result of years of investigation and exclusive interviews by the author, The Price of Blood is a chilling and shocking account of how a power-mad one-time physician truly morphed from a Dr. Jekyll to a Mr. Hyde. 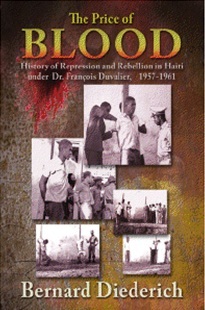 The years following Duvalier’s first reign of tyranny are chronicled in the companion volume Murderers Among Us: History of Repression and Rebellion in Haiti Under Dr. François Duvalier, 1962-1971. Bernard Diederich covered Mexico, Central America, and the Caribbean as a correspondent for Time magazine. He is the author of 1959: The Year that Inflamed the Caribbeean, Trujillo: The Death of the Dictator, Somoza and the Legacy of U.S. Involvement in Central America, and Papa Doc and the Tontons Macoutes (all available from Markus Wiener).